A couple of recent changes at the Great Road Shopping Center. 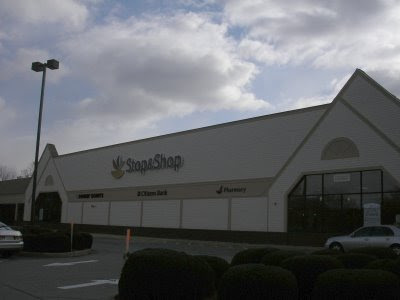 First the exterior renovation of the Stop and Shop has been completed. As previously mentioned, The Bedford Stop and Shop underwent an interior renovation in the Spring. When the renovation was completed, it seemed odd that the exterior was not updated and in fact had peeling paint. It now seems likely that the exterior renovation was put on hold until the new Stop and Shop logo was rolled out at the end of August. 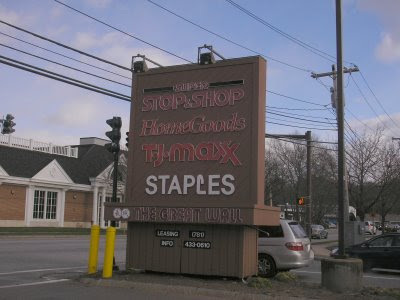 The new exterior features the updated Stop & Shop logo and gives it a more traditional New England type design. While the logo is multi-colored, it's very subdued when lit at night. Along with the exterior renovation, some remaining interior renovations have been completed. The store uniforms are now yellow and purple. The customer service seems to have improved as well. While there used to be only one cashier in the late evening, there are now two, eliminating the long lines that used to occasionally occur. 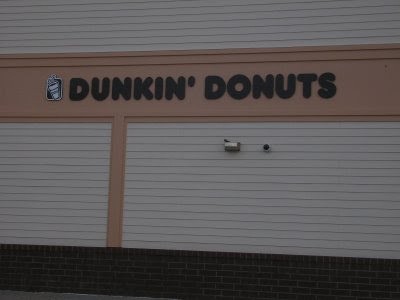 In conjunction with the renovations, additional security cameras have been added both inside and out. A quick count revealed 58 cameras. The second change was the quick closure of Payless ShoeSource. According to employees working in nearby stores, Payless was open one day and then gone the next. So far it looks like it was only the Payless in Bedford that closed. 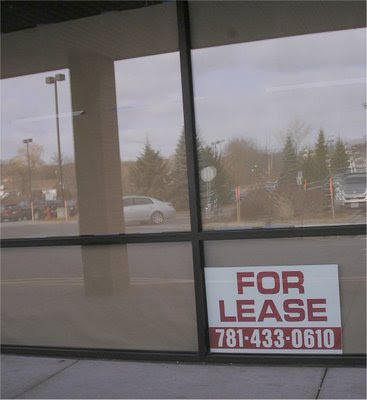 The space previously occupied by Payless ShoeSource is available for lease. With the bleak economic news, I would not be surprised to see some other store closings over the next few months. I am also wondering what the impact the economy will have on upcoming renovations. Two weeks ago it was announced that the renovation of the Blake Block is officially "delayed". As far as the Bedford Marketplace, phase one of the expansion still appears to be scheduled for the Spring. In fact it looks Panera Bread might be one of the new restaurants.